During my recent vacation in Paris, I made a pilgrimage to my absolute favorite bakery in the world: Poilâne, purveyor of the best artisanal bread in France. Even though I once lived in this neighborhood of Paris, I always get lost wandering through the medieval maze of cobblestones streets on my way to find the shop on the Rue du Cherche-Midi in the 6th arrondissement. It’s easy to walk right past Poilâne. The storefront is so unassuming—it provides no clues that this is the most famous bakery in France. Enter the inviting little shop to be greeted by friendly staff, fresh-baked bread and complimentary cookies! Poilâne feels more like an old-fashioned country village bakery. Except for a scale to weigh the bread and a small cash register, there is nothing modern in this shop. You'd never guess that Poilâne is a big business. The bakery supplies to thousands of Paris supermarkets as well as hundreds of restaurants all over France. They even ship bread to all corners of the globe by priority airmail—more than two hundred thousand loaves a year are sent to clients in twenty countries, according to December 2012 New Yorker article. Also noted in this article, Poilâne grosses 18 million dollars a year. Despite the mass production, Poilâne remains a boulangerie artisanal, true to its original spirit. Poilâne specializes in pain au levain, sourdough bread made from the finest ingredients: stoneground wholewheat flour, water and sea salt from Guérande. The rising agent is a piece of dough from the previous batch, and the loaves are baked in wood-fired brick ovens. Poilâne bread is handcrafted using techniques developed by Pierre Poilâne, who opened the bakery in 1932. His son, Lionel took over the company in 1973 and now his daughter Apollonia, who went to Harvard University, runs the business. Sold by the slice or by the kilo, Poilâne bread is reasonably priced. For just a few Euros, you can purchase a quarter of a loaf that will last you for two to four days (depending if you eat two or four slices per day!) Despite being so inexpensive, Poilâne bread is the best you could buy for any amount. The bread is perfectly balanced, not too salty or sour, slightly nutty in flavor, with just the right moist, springy texture and crunchy crust. 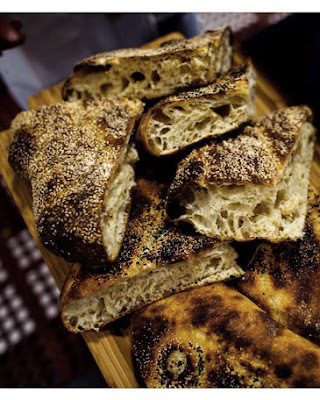 Why is this exceptional gourmet bread so surprisingly affordable? 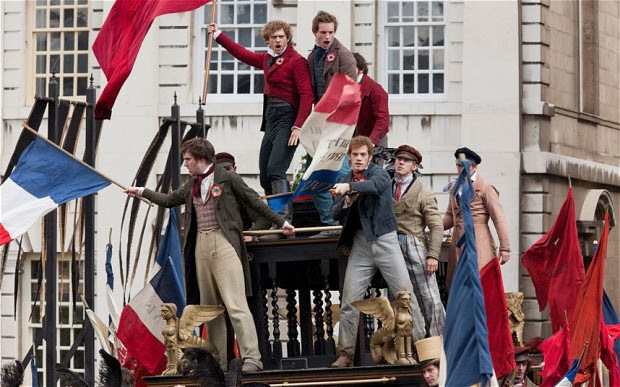 In France, bread has been subsidized since the French Revolution. Lionel Poilâne believed in quality over quantity. That explains why Poilâne only offers a small selection of simple products. Each product is crafted to perfection! 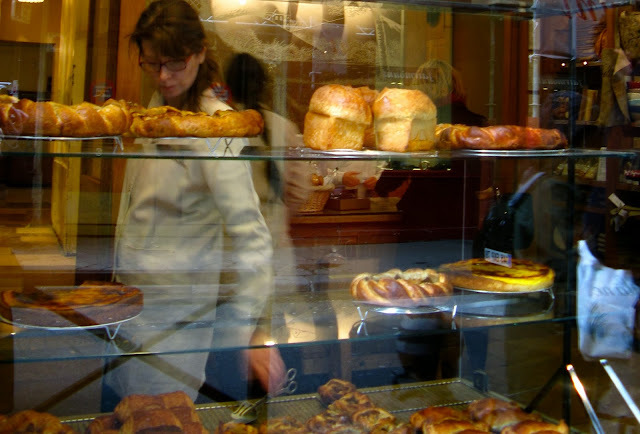 There are just a few types of bread, croissants, pain aux chocolate, brioche and classic Breton-style flan. Poilâne's "less is more" philosophy is an example of how to specialize in a small range of products and offer the best quality. I wish that American shops would try this approach! When you reach the counter at Poilâne, you'll find a basket of irresistible little butter cookies known as "punitions". You're allowed to sample the cookies while you wait in line! In case you're wondering about the cookies' odd name, here's the story: French grandmothers would make these cookies for their grandchildren and teasingly call them "punitions" (“punishments”) as they would surprise the kids with treats instead of reprimands. These crunchy butter cookies are truly addictive. The famous Poilâne sugar cookies called "punitions"
One last and most important mention: When you visit Poilâne, you must sample the tartlette aux pommes, the most amazing apple tart that I’ve ever tasted in my life! These individually sized tarts are so simple yet so special. The flakey, buttery pastry crust melts in your mouth and the apples are perfectly caramelized. The center of each tartlet is dotted with a spoonful of brown sugar, which adds just the right amount of sweetness. In an article published in 2011, acclaimed food writer David Lebovitz explains that he is crazy about this apple tart. In addition, Lebovitz even claims that Poilâne bread was one of the main reasons that he moved to Paris! Ooh, la la!! The absolute most perfect tarte aux pommes! Love this post! It so magically captures the French patisserie--I feel like I'm right there with you! But alas, I'll have to settle for the excellent recipe. Keep up the delicious posts, Miss Patisserie! I feel like I just took a trip to Paris...how magical and wonderful. Thanks for bringing Paris to us! You should go back for a visit! There are some wonderful new shops on the rue de Cherche-Midi! Also Poilâne opened a stylish bar next-door called the Cuisine de Bar. It's the perfect place to stop in for a casual lunch—they make delicious "tartines" (open-faced sandwiches) using toasted Poilâne bread!